At the invitation of Kofi Annan and under the auspices of the Kofi Annan Foundation, the President of Côte D’Ivoire, H.E. 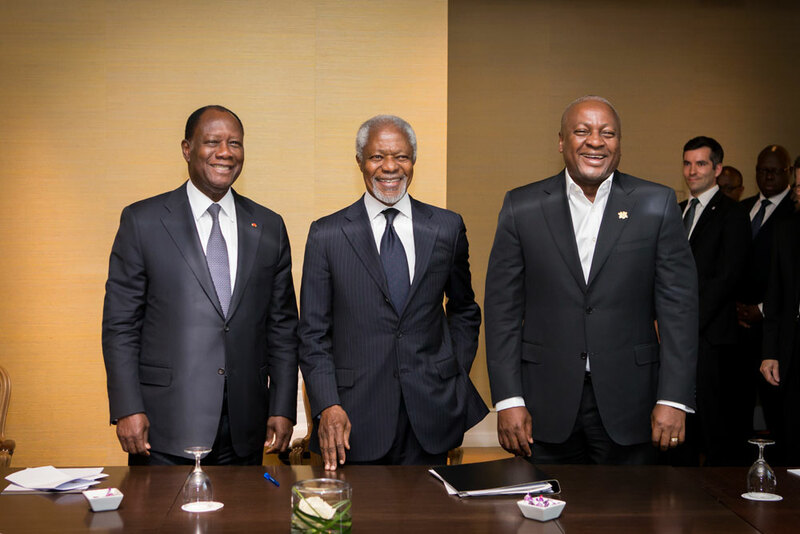 Mr. Alassane Ouattara, and the President of Ghana, H.E. Mr. John Dramani Mahama, met in Geneva in May 2015 to discuss a dispute over the maritime boundary between the two countries. In accordance with a recent ruling by the Special Chamber of the International Tribunal for the Law of the Sea (ITLOS), the two Presidents, true to their mutual vision of regional integration, decided to engage in a process to achieve cooperation. The Parties’ objective remains to delimit the border. At the end of the meeting, both Presidents reiterated their commitment to promote discussions that favour regional integration for the benefit of their respective countries. The two Presidents thanked Mr. Annan and the Foundation for facilitating the meeting and expressed their desire to continue to draw on Mr Annan’s experience as they promote cooperation between their countries.